It's the end of the world. Did you think it would be easy? I don't expect you to win. I don't even expect you to live - only endure. I kept my word. How about a little gratitude? Perhaps... but it's not like I have anything left to lose. It is quite funny to think I caused most of the city's downfall, all thanks to my apprentice Terra and to other villains who co-operated with me... but, it seems like the fun of fighting the Titans has run out. Next time, my plan will work, and the Titans will be all mine... Did I just say mine? I meant dead. They'll be dead. No, no -- don't call me master... Call me Senpai. Do some misc. noises and sounds here. 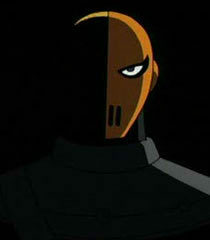 I would recommend maniacal laughing and fighting noises for Slade.